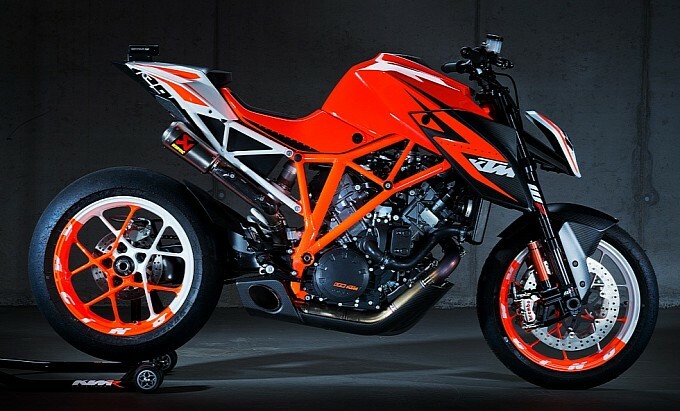 The official release of the 1290 Super Duke R is planned for Monday the 30th of September. The highly anticipated naked bike has already appeared in numerous videos and prototype pictures so far. What we do know is that the 1290 Super Duke R will look menacing, especially with that fantastic Akrapovic racing pipe. See how one pipe exits the belly pan and the other pipe appears out the top of the rear wheel, fantastic. It is rumored that the latest KTM motorcycle will produce around 180hp. Not hard to believe whilst watching this video below. Yes, the BMW S1000RR isn’t on the limit at all, but naked bikes generally can’t even compete with superbikes, so the video is interesting nevertheless.